For Saturday morning, the Saturday morning dress. Because when you're off to the market, what you really want to do is pop a dress over your head, button four buttons at the small of your back (how does that work again? ), and go! Click on the image to see it larger, in a new window, the better to check out the diagram in the lower right-hand corner and confirm that it is, in fact, flat. Oh my. 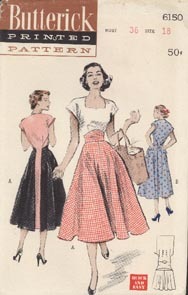 I like this one better than the similar Walkaway Dress (Butterick 4790). Any chance they’ll reissue it? hey warrior seamstress….I was just thinking the exact same thing! if you find one, can we share it?